The ghosts of Huron County’s past came back to life last week! The Spirit Trail Super-Natural Hike in Exeter was originally scheduled for October 17th, but with the rainy weather it was rescheduled to the following evening. Luckily, Friday brought no rain, but it was a chilly evening. I bundled up, flashlight in hand (just in case), and headed to MacNaughton Park in Exeter. 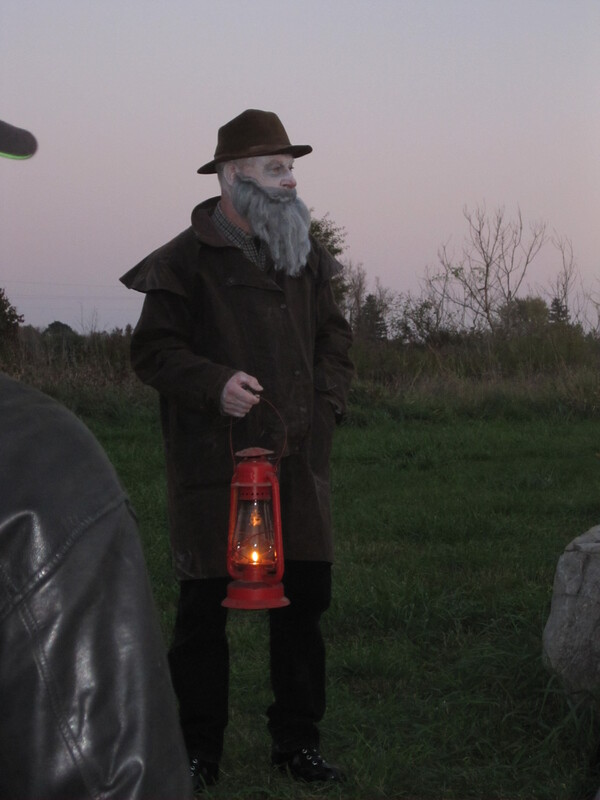 Since 2010, a volunteer community group called the Friends of the South Huron Trail have held this spooky hike. The hike along the South Huron Trail features characters from local history, with an environmental theme. The hike was free, and I saw hikers of all ages enjoying interacting with the characters. The hike was about an hour, and after starting at MacNaughton Park, it loops back to the start via the Stirling Bridge. The moon was very visible about half way through the hike, which added to the “spookiness”. Along the way I met some spirits from our area’s past, including Mr. James and Mrs. Jane Willis, Mr. Gidley, James Stephen Jr. (aka King Stephen), the Green Lady of Hay Swamp, Dr. Smillie, and former canning factory workers. Mr. and Mrs. Willis led the hikers through the moonlight trail with an oil lamp. Along the way, each spirit kindly introduced himself or herself (except for the Green Lady who caught us all by surprise!) and explained what life was like back then. All the spirits gently reminded us that we are future stewards of the environment – and that we have an important role in how we protect our surroundings.